Hippo Leisure have transformed the poolside and flume spiral stairs at Uckfield Leisure Centre with a bright and vibrant, non-slip, wet pour Aquatrol safety flooring. The existing tiled flooring around the upper and lower levels of the poolside, including a ramp, podiums and steps were all included in the flooring refurbishment, a total of 284m². 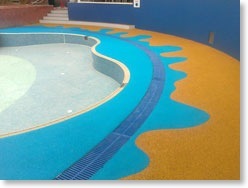 As well as enhancing safety around the pool hall, the flooring will increase kid appeal with its highly visual impact. 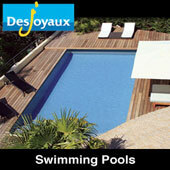 Children of all ages will love the poolside blue and sandy yellow water splash design. 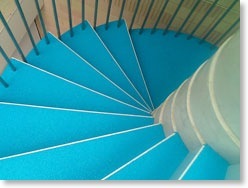 The blue coloured flume stairs will be a hit with older children who can be particularly vunerable in an area where there is likely to be a large volume of traffic. Hippo’s seamless application enables stairways and pool areas of all shapes and sizes to be finsished in Aquatrol safety surface. Hippo’s safety flooring is very attractive to leisure centres due to the unique anti-bacterial inhibitor added during the flooring installation process. 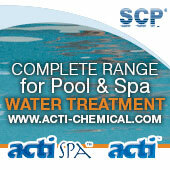 This ensures that bacterial growth is minimised for the life of the padding, providing leisure centre operators with peace of mind towards the health and safety of their bathers. Hippo also installed three mirrored portholes around the outside wall of the spa pool. These portholes are very effective in providing colourful decoration around the pool and give great visual stimulation, as light reflects off the water and bounces off the mirrors. The portholes do not require any water supply, are designed to provide play opportunities for children of all age and ability groups and will not interfere with any lessons or other normal pool uses. Porthole mirrors and other Hippo Splash Toys, such as toddler slides and play panels are ideal as a starting point for introducing interactive play into the pool, and provide a great opportunity for the expansion of incorporating more play features in the future.